distribution Mainly the inner half of the Coastal Plain; scattered into the lower Coastal Plain in the southeastern region, and also at a few sites in the eastern and central Piedmont. The range in the Coastal Plain is expanding northward, as many new records came from the Roanoke River area in 2012; the species was previously known northward only to the Neuse River area. In fact, until 2013, Virginia had no records; however, there are now (2018) five records for the southeastern and central parts of that state. abundance Common, at least locally, along the upper part of the Roanoke River (Halifax and Northampton counties). Uncommon and local in the southern half of the Coastal Plain, but rare and local elsewhere, as it is recorded from only 12 other counties in NC in a moderately small range. Dunkle (2000) considers the species to be fairly common, whereas in GA Beaton (2007) say it is uncommon in the Coastal Plain but rare elsewhere. flight Spring season only; the known dates in NC range from 12 April to 31 May. habitat Large or medium rivers with silty or sandy bottoms. behavior Males spend little time in flight patrols over the water. Teneral individuals, as well as adults, often forage hundreds of yards away from rivers, such as along clearings, dirt tracks, and forest openings. It is an unwary species and can be easily approached on the ground. comments This is one of the relatively few clubtails to be found along slow-moving rivers and large creeks in the Coastal Plain. 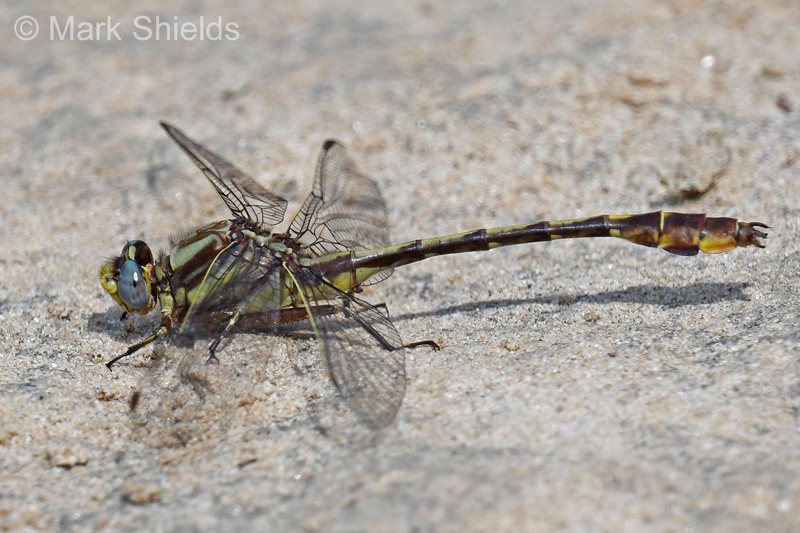 (The majority of clubtails are found in the mountains and Piedmont, and near faster waters.) Randy Emmitt photographed one, on 3 May, at Kinston in Lenoir County; and Beth Brinson extended the known range to the north with a photograph taken in Davidson County in 2008. Steve Hall and Harry LeGrand found it commonly on several spring dates in 2012 at sites within 1/2-mile of the Roanoke River, for a notable northward range extension. As it has been found in VA in 2013, 2016, and 2017, it is obviously moving northward. The species is still on the NC Natural Heritage Program Watch List, but as it is clearly moving northward, it is uncertain if it will remain on that list.